Crafted in rugged waterproof leathers and finished with the B.S.F.P.™ motion efficiency system with an active rubber lug outsole for superior traction, our Chocorua Trail boot is suited to all-terrain adventures - whether it's a leisurely day hike or a multi-day backpacking trip. The Gore-Tex® membrane will keep your feet dry and comfortable; the removable EVA footbed, padded collar and gusseted tongue provide the comfort you need while you're out in the backcountry. 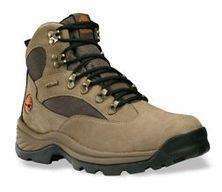 Not convinced that these are a good hiking boot. Timberland are more interested in fashion. Beware of fake! Last time, I had a very fake one with no definition in the logo at all and they weighed considerable less than the genuine. In the end, it cost me postage! This is the Timerbalnd outlet selling these. I reckon they just might be genuine. Not convinced that these are a good hiking boot.Timberland are more … Not convinced that these are a good hiking boot.Timberland are more interested in fashion. Among other hikes, I've walked 200km through France from the Pyrenees up through the Massif Central as well as climbing Red Pike in these boots. They're solid.